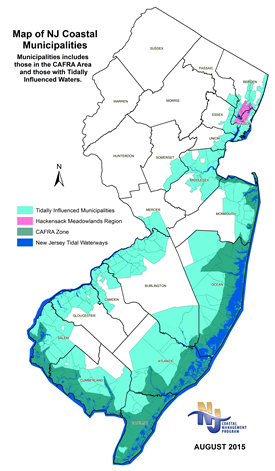 New Jersey’s Coastal Management Program (NJCMP) is part of the National Coastal Zone Management Program which addresses some of today’s most pressing coastal issues, including sustainable and resilient coastal community planning, climate change , ocean planning, and planning for energy facilities and development. It is a voluntary partnership between the federal government and U.S. coastal and Great Lakes states and territories authorized by the Coastal Zone Management Act (CZMA) of 1972 and administered by the National Atmospheric and Oceanic Administration (NOAA). The NJCMP is comprised of a network of offices within the Department of Environmental Protection that serve distinct functions yet share responsibilities that influence the state’s coastal areas. An important aspect of the NJCMP is ensuring that coastal resources and ecosystems are conserved as a vital part of local, state and federal efforts to enhance sustainable coastal communities. New Jersey's coastal zone encompasses tidal and non-tidal waters, waterfronts and inland areas. The coastal zone includes the Hudson River from the interstate border with New York and related tidal waters, south to the Raritan Bay. It continues along the Raritan Bay then extends south from Sandy Hook to Cape May Point encompassing the state territorial waters of the Atlantic Ocean and associated tidal water bodies. From Cape May Point, the coastal zone trends north to Trenton and contains waters of the Delaware Bay and River and includes tidal portions of their tributaries. Upland areas along these tidal waterways are included within the coastal zone. New Jersey’s coastal zone boundary encompasses approximately 1,800 miles of tidal coastline, including 126 miles along the Atlantic oceanfront from Sandy Hook to Cape May. It ranges in width from 100 feet to 16.5 miles. The coastal zone is comprised of the following boundaries: inland, seaward and interstate. A description of each of these boundaries follows. Federal regulations require states with approved coastal management programs to submit any changes or amendments to their coastal management programs to the NOAA so that they can determine if the program, after the change, remains approvable. In compliance with these regulations, the Department is proposing to modify the Federally approved New Jersey Coastal Management Program (NJCMP) to incorporate as an enforceable policy the Shore Tourism and Ocean Protection from Offshore Oil and Gas Act signed by Governor Murphy on April 20, 2018 pursuant to Federal Regulation 15 C.F.R. 923.80-923.84. The landward limit of the Waterfront Development area outside both the CAFRA area and the New Jersey Meadowlands District. This includes all lands extending from the mean high water line of a tidal water body to the first paved public road, railroad, or surveyable property line existing on September 26, 1980, generally parallel to the waterway, provided that the landward boundary of the upland area shall be no less than 100 feet and no more than 500 feet from the mean high water line. This area, which is referred to as the upland Waterfront Development area, includes portions of Salem, Gloucester, Camden, Burlington, Mercer, Middlesex, Monmouth, Somerset, Union, Hudson, Essex, Passaic and Bergen. New Jersey's seaward coastal zone boundary is the limit of the New Jersey territorial jurisdiction located three nautical miles from the mean high water line. New Jersey’s interstate coastal zone boundary is the state lines shared with New York, Delaware, and the Commonwealth of Pennsylvania. The State boundary of New Jersey and Delaware is generally the center of the shipping channel of the Delaware River with the exception of the area located within the 12-mile circle. In accordance with the decree of the United States Supreme Court in State of New Jersey v. State of Delaware, 552 U.S. 597, 623-24 (2008), the State of New Jersey may, under its laws, grant and thereafter exercise governing authority over ordinary and usual riparian rights for the construction, maintenance, and use of wharves and other riparian improvements appurtenant to the eastern shore of the Delaware River within the 12-mile circle and extending outshore of the mean low water mark. The 12-mile circle is the circle the radius of which is 12 miles, and the center of which is the building used prior to 1881 as the courthouse at New Castle, Delaware, the arcs of which are as set forth in the decree of the United States Supreme Court in New Jersey v. Delaware, 295 U.S. 694 (1935). Within the 12-mile circle, the State of Delaware may, under its laws and subject to New Jersey’s authority over riparian rights as stated above, exercise governing authority over the construction, maintenance, and use of those same wharves and other improvements appurtenant to the eastern shore of the Delaware River within the 12-mile circle and extending outshore of the low-water mark, to the extent that they exceed ordinary and usual riparian uses. Federal Consistency requires federal actions, occurring inside or outside of a state’s coastal zone, that have a reasonable potential to affect the coastal resources or uses of that state’s coastal zone, to be consistent with that state’s enforceable policies. Enforceable policies are state policies that are legally binding and by which a state exerts control over coastal uses and resources. The NJCMP’s enforceable policies include the regulations, statutes, and documents. Under the Federal Coastal Zone Management Act (CZMA), the 309 Coastal Zone Enhancement Program was developed to encourage states to enhance their Coastal Management Programs (CMP) in one or more of nine areas. These “enhancement areas” include aquaculture, coastal hazards, coastal wetlands, cumulative and secondary impacts, energy and government facility siting, marine debris, ocean resources, public access, and special area management plans. The priority needs and information gaps for program enhancement. Based on the assessments, the State develops a comprehensive five-year strategy to address the high priority needs for the CMP and set forth specific program enhancements for one or more of the high priority ranked areas in order to identify program changes and implementation activities. New Jersey initiated the 2016-2020 Section 309 Assessment and Strategy on October 1, 2014. This process included stakeholder engagement and close coordination with NOAA’s Office for Coastal Management. The NJCMP 309 Assessment and Strategy for 2016-2020 approval letter was received by the Office of Coastal and Land Use Planning on September 28, 2015. Under the CZMA Act, the federal government provides financial assistance to states that develop and maintain approved coastal zone management programs. CZM grants are received annually from the National Oceanic and Atmospheric Administration (NOAA), Office of Ocean and Coastal Resource Management (OCRM). The grants are generally 18 months in duration, from October 1 of one year to March 31 two years later. The Office of Coastal and Land Use Planning (OCLUP) administers the planning and enhancement aspects of the NJCMP. OCLUP staff develops and implements long range planning projects such as resiliency and public access planning and coordinates their efforts with complementary programs having similar interests and initiatives in the coastal area. These complementary programs include the Jacques Cousteau National Estuarine Research Reserve (JCNERR), and three national estuary programs (Delaware Bay, NY/NJ Harbor, and Barnegat Bay) as well as the coastal programs of adjacent states. In addition, staff works with municipal, county, and state government, as well as non-profit groups on the development and implementation of the Municipal Public Access Planning program and Coastal Community Resiliency Planning. OCLUP staff also administers the Living Shorelines program and Coastal Zone Management Grants, including preparation of grant performance reports. OCLUP staff also administers and reports on CZM awards. The Office of Policy Implementation (OPI) is responsible for the development and promulgation of the rules and regulations that govern the Division of Land Use Regulation, including: the Coastal Zone Management rules, N.J.A.C. 7:7; Flood Hazard Area Control Act Rules, N.J.A.C. 7:13; and the Freshwater Wetlands Protection Act Rules, N.J.A.C. 7:7A. OPI is also responsible for the preparation and submission of all program changes related to the NJCMP. Further, OPI conducts stakeholder outreach and education related to the land use regulations. OPI is also responsible for coordinating all Federal consistency reviews. The Division of Land Use Regulation (DLUR) reviews coastal permit applications submitted to the DEP under CAFRA, the Waterfront Development Law, and the Wetlands Act of 1970. The DLUR also reviews permit applications submitted under the Freshwater Wetlands Protection Act, Flood Hazard Area Control Act, and conducts federal consistency reviews. The Bureau of Tidelands Management within DLUR, serves as staff to the Tidelands Resource Council. The Council is responsible for conveyance of State-owned tidelands. The Office of Dredging and Sediment Technology reviews coastal permit applciations for dredging and port development projects. ODST also coordinates local, state, and federal dredging efforts. The Division of Fish and Wildlife is dedicated to the protection, management and wise use of New Jersey's fish and wildlife resources and includes the Marine Fisheries Administration (for example marine fisheries and shellfisheries) and the Non-game species programs. To that end, they provide technical assistance for DLUR application reviews. The Engineering and Construction Program manages coastal area dredging and shore protection projects, and provides aids to navigation. Shore protection projects include beach replenishment, bulkhead installation, and groin modification. Engineering and Construction also participates with the US Army Corps of Engineers on all Corps sponsored shore protection projects in New Jersey. The Green Acres Program was established to address New Jersey's growing recreation and conservation needs. The primary focus the creation of open space corridors by acquisition of land linking existing protected areas. These corridors provide valuable contiguous habitat that facilitates the movement of wildlife and opportunities for linear recreational and scenic parkland between towns and urban centers. Many of these lands are in the coastal zone. The Blue Acres Program was created with the passage of the Green Acres, Farmland, Historic Preservation and Blue Acres Bond Act of 1995. The bond act provides $15 million for grants and loans to municipalities and counties to acquire coastal lands for recreation and conservation that are storm damaged, prone to storm damage, or that buffer or protect other lands from storm damage. The New Jersey Sports and Exposition Authority (formerly the New Jersey Meadowlands Commission) is the lead planning and management agency within the New Jersey Meadowlands. The Division of Science, Research and Environmental Health ensures that the Department’s decision-making is based upon the best possible scientific and technical information. The office performs research to meet the information and problem-solving needs, identify and understand emerging issues that require the Department’s attention and to advocate and/or integrate the multi-disciplinary perspective into the Department’s identification, analysis and resolution of environmental issues. The Division of Water Monitoring and Standards provides water quality information to assess and manage New Jersey's water resources. The Division is responsible for river/lake/ground water monitoring, beach/bay/ocean monitoring, water quality standards and assessments, TMDL’s, restoration projects, and citizen science. The Bureau of Tidelands Management serves as staff to the Tidelands Resource Council, a board of twelve Governor-appointed volunteers responsible for conveyance of State-owned tidelands. Tidelands, also known as riparian lands, are all lands that are currently and formerly flowed by the mean high tide of a natural waterway. All tidelands are overseen by The Council and Bureau of Tidelands Management. The Bureau of Coastal and Land Use Compliance and Enforcement investigates possible coastal and freshwater wetland violations and seeks remedies for violations. The Bureau is also responsible for ensuring compliance with coastal and freshwater wetlands permits issued for projects throughout the coastal area. They are responsible for enforcing the regulatory programs established under six separate environmental protection statutes which provide authority to regulate development (including clearing of vegetation and filling) within environmentally sensitive areas such as beaches, dunes, wetlands and floodplains. New Jersey’s interest in its tidal waters precedes the American Revolution, for under the public trust doctrine of English common law, tidal waters and the land thereunder belonged to the sovereign for the common use of all the people. With the Revolution, the royal rights to the State’s tidelands became vested in the people of New Jersey. In 1821, the State Supreme Court in Arnold v. Mundy (6 N.J.L. 1) articulated the State’s right to convey, regulate, improve and secure the tidelands for the common benefit of every individual citizen, but also determined that neither the State nor the purchaser or licensee of tidelands could impair the public’s common rights of fishing and navigation in tidal waters. In 1869, the General Riparian Act was passed setting forth the procedure by which an administrative agency, then the Riparian Commissioners, could alienate State-owned tidelands. In 1914, the State Legislature passed the Waterfront Development law, the first law regulating land areas along tidal waters. This Law requires that prospective developers obtain State agency approval for “all plans for the development of any water-front upon any navigable water or stream of this State or bounding thereon…” (N.J.S.A. 12:5-3. The next major law affecting the State’s coastal areas was passed 55 years later, in 1969. The Hackensack Meadowlands Reclamation and Development Act established to regulate the development of 21,000 acres of Hackensack River meadowlands in 14 municipalities. Concerted coastal management efforts began in New Jersey in 1970 with the passage of the Wetlands Act of 1970, followed by the Coastal Area Facility Review Act (CAFRA) in 1973. In response to the 1972 passage of the Federal Coastal Zone Management Act, in 1977, the Commissioner of the Department of Environmental Protection submitted to the Governor and Legislature the Coastal Management Strategy for New Jersey CAFRA Area (September 1977), prepared by the Department as required by CAFRA, N.J.S.A. 13:19-16, and submitted for public scrutiny in late 1977. The Department revised the Coastal Management Strategy and published the “New Jersey Coastal Management Program-Bay and Ocean Shore Segment and Final Environmental Impact Statement” in May 1978. The proposed program covered the CAFRA area only. In August 1978, the Governor submitted the revised “New Jersey Coastal Management Program-Bay and Ocean Shore Segment and Final Environmental Impact Statement” for Federal approval. The approval was received in September 1978. In May 1980, the Department submitted further revisions, published as the “Proposed New Jersey Coastal Management Program and Draft Environmental Impact Statement.” These revisions incorporated the northern waterfront area, Delaware River area and New Jersey Meadowlands into the Program. In August 1980, the Department submitted the “New Jersey Coastal Management Program and Final Environmental Impact Statement” for Federal approval. The approval was received in September 1980. The regulatory authority of the NJCMP has evolved over the years through the addition of new, and amendments to, existing enforceable policies, and the development of its Coastal Nonpoint Pollution Control Program, Coastal and Estuarine Land Conservation Program, and Clean Marina Program.